I’m one of those who was around when Crash Bandicoot first came onto the scene in 1996. I’m not saying this to appear as some kind of 32-bit hipster, but I feel it’s an important thing to mention when looking at the remaster of a game which is now twenty-two years old. I have a fondness of Crash. His design is simple and somewhat apes the Tazmanian Devil of Warner Bros fame, utilising a spinning attack and a less stable mindset. At the time, he was a breath of fresh air. Not that players were bored of Mario, maybe getting a little tired of Sonic, but Crash epitomised the decade of his conception and his first game did much of the same. Back in 1996, working through a 3D or pseudo-3D environment was brand new. While Crash Bandicoot still featured 2D sections, it was his running into the depth of field which captured so many minds. Of course, his Indiana Jones antics – running towards the camera away from a boulder – is probably most remembered by those who played the original. The thing is, it was all very experimental. A lot of the time Crash would miss platforms as his manoeuvrability was less than tactile and enemy hit boxes were unforgiving, often leading to unfair deaths. Frustratingly, but also oddly pleasingly, these nuances have been kept in for the Crash Bandicoot N. Sane Trilogy release. It’s pleasing to see the developers keep in minutiae that made the game what it was back in the day, but for modern day gamers and us old ones who’ve adapted to more fluid styles of platforming, this trilogy can lead to maddening moments. There are too many situations of spinning into an enemy only to see the death animation. The same goes for jumps onto moving platforms that you know you can reach, but somehow plummet into the open depths of the level. Because, controversially, Crash Bandicoot wasn’t mechanically a very good game. This doesn’t stop the trilogy being a great addition to your gaming catalogue, but it does mean you need to be aware that there will come times when you’ll need to farm for extra lives, or glare at the continue screen, because a boss didn’t telegraph a certain attack; something we’re now so used to. Away from enemies seemingly (unfairly) killing you, the platforming moves from brilliance to head-bangingly irritating. Again, this mostly comes from the fact that games have come so far from where they once were and I admit, I fell into the rote techniques I’m so used to. Crash isn’t going to grab edges of platforms if you skim them and he is unwieldy in the air, moving with the grace of a levitating hippopotamus. Oddly, these flaws don’t detract from the style of the game, nor the nostalgia. However, I can’t help but think that new gamers and younger gamers, might find this style a little too troublesome, or tedious. Thankfully, there are three games here and Crash Bandicoot evolved over the sequels which brought in new ideas, playstyles and characters. The first game looks at platforming from different angles and perspectives, moving the camera around to force the player to adapt or even guess how to move Crash. In the boulder levels, caverns must be cleared, usually without knowing how big they are or whether they will hold a moving platform. The second and third games, are a little more forgiving, allowing a fraction of a second more for errors to be corrected, rather than running through lives. There are checkpoints throughout levels, but don’t let them fool you – something Naughty Dog originally did with the game was vary the length of levels. Some are only a few checkpoints long, others seem to go on forever. When the movement goes well, the Crash Bandicoot N. Sane Trilogy is a joy to play, the boss fights are another matter. Across all three games, they flip-flop between ultra hard and super easy, some forcing you to burn through lives, some dispatched in one go. The Crash Bandicoot N. Sane Trilogy is unbalanced and wicked in places, but the updated visuals go quite far in charming the player and keeping them playing. Despite my growing anger, I still wanted to boot up the game, knowing that I could eventually nail a section and feel like a platforming God – fourteen-year-old me would be proud. I’m quite pleased that this remaster doesn’t mess about with the way the game used to play, the welcome changes come from updated graphics, making Crash look better than ever and the ability to play as Coco in the earlier games is a lovely touch. The stories are just as throwaway as they were the first time around, but they now hold a more humorous slant, probably based in irony. 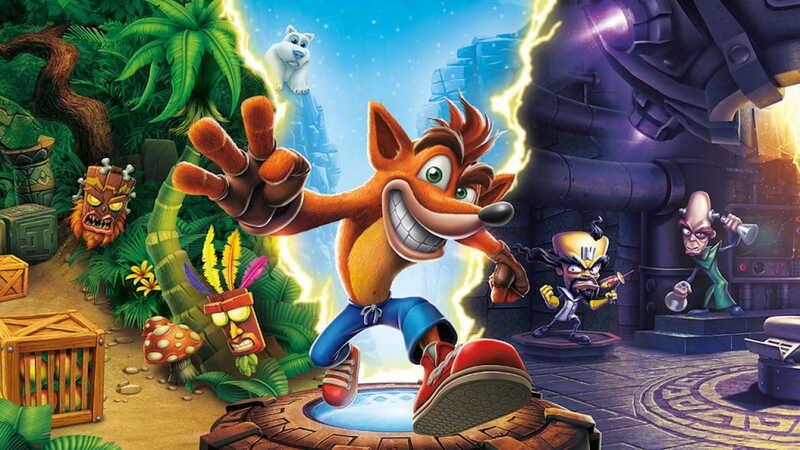 As a piece of history, the trilogy works incredibly well and gives players a chance to see how the games grew and progressed over the years – I never thought I’d say the third Crash game is the best, but here we are. The latter two games brought new abilities to Crash’s arsenal as he fought to keep up with other characters coming onto the platforming scene. Crash could slide, giving him a run-up to clear longer gaps or higher platforms and he began to use vehicles and animals for more fast-paced running sections. These levels still please and hold up, many years later. Riding a baby polar bear, watching it galumph forwards, waggling its legs as it clears pools of leaping whales is exhilarating and intense and a genuine highlight. It’s odd to see the old wannabe Sony mascot grace the Switch and he looks superb both docked and in handheld. The colours pop and the animations of Crash’s odd-ball antics are smile-inducing – his various death animations still make me grin over two decades later. With the addition of the super hard levels which never made it into the PlayStation discs first time around, if you can grit your teeth through those ludicrous flaws, then this is a must own game for the Nintendo system.